Edited by Lew Ellingham and Stan Persky. No. 2 edited by Lew Ellingham. Vol. 1–vol. 6, nos. 1–19 (Summer 1971–Spring 1984; publication ceased 1980–83). Double issue 11/12 (December 1975 is the Cid Corman issue). Edited by Lewis Ellingham and David Franks. Nos. 1–6 (1965–66). Each issue has an original newspaper cover hand-stamped with the issue number. Nos. 1–4 (1969–Spring 1971); Red Crow nos. 1 [which is Mail no. 5]–2 (1972–73). Edited by Paul Mariah and Richard Tagett. Nos. 1–12 (1969–81). No. 6/7 is a double issue. Some issues have distinct titles: No. 10 is “The Jack Spicer Issue,” no. 11 is Voices of the Seventies, no. 12 is Complete Poems of Jean Genet. Vol. 1, no. 1–vol. 4, no. 2. 14 issues. Title varies throughout. Edited by Joyce Holland [Dave Morice]. Nos. A–M? (1973–?). No. E & H is the double “Veterans Administration” issue. Each issue comprises a small pamphlet stapled inside the cover of a matchbook. Nos. 1–8 (May 1969–November 1971). Nos. 1–6 (May 1977–October 1978). Edited by Peter Kostakis, Darlene Pearlstein, Bob Rosenthal, and others. Nos. 1–4 (Spring 1968–Winter 1968). Edited by D.r. Wagner and Barbara O’Connelly. Nos. 1–4 (1966–68). Moonstones no. 4 is also Runcible Spoon no. 3. Edited by David Pollens, David Wasser, Norman Stein, and Patrick McEntree. My Landlord Must Be Really Upset. Edited by D.r. Wagner and Ingrid Swanberg. See also George: Son of My Own Mag. Magazine of Far-Out Studies [1970?]. The Marrawannah Newsletter 2 (1966). 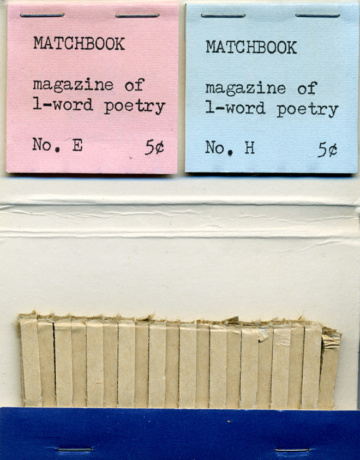 Matchbook: Magazine of 1-Word Poetry, nos. e–f [1972? ].